Robot Entertainment (the studio behind Orcs Must Die!, Hero Academy, and, of course, the co-op tower defense/action RPG hybrid Orcs Must Die! 2) turns four years old this weekend! Congrats, guys! To celebrate, they're running a massive 75% off sale on their games and DLC. 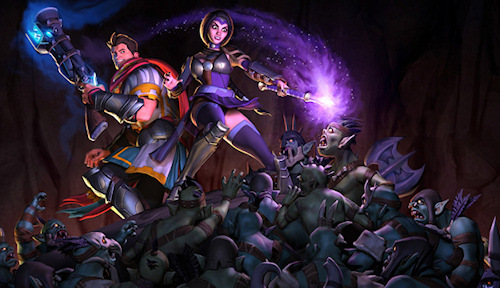 During this weekend, you can pick up Orcs Must Die! 2 for a mere $3.74 through their store! It'll provide you with a code that you can redeem through Steam (note that Steam itself is not offering this sale, so you'll have to go through the Robot Entertainment store for the discount). If you want more than the basic game, you can also pick up the "Complete Pack" which contains OMD2 and all three of its DLC packs for $6.24. Or if you want to pick up TWO complete packs for yourself and a friend (and honestly, OMD2 results in the most fun and hilarity in co-op, of course) you can pick up the "Complete Pack - Two Pack" for $9.99. And if you already have the game, but haven't checked out the DLC, they're being offered for just $1.24 apiece. OMD2 was definitely one of my favorite games of last year (we gave it a 5 out of 5), so it's an absolute steal at this price. Orcs Must Die! 2 supports 2-player online co-op for the PC. Orcs Must Die! 2 Asks - "Are We There Yeti?" Page created in 0.2691 seconds.